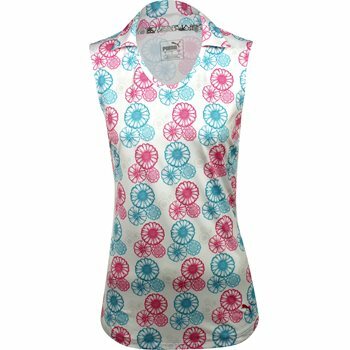 The Puma Blossom Sleeveless polo delivers a fun twist on a classic top. It features a chic floral pinwheel pattern, a scooped neckline, and a Puma cat at the left hem. The polyester make up offers durability for machine washing and resistance against shrinking, mildew and wrinkles. The stretch fabric provides a comfortable fit and allows movement with ease. In addition, dryCell moisture wicking draws sweat away from the skin to keep it cool and dry for all day comfort.